^ 2.0 2.1 2.2 2.3 2.4 Loxodonta africana. IUCN Red List of Threatened Species 2010. International Union for Conservation of Nature. 2008. 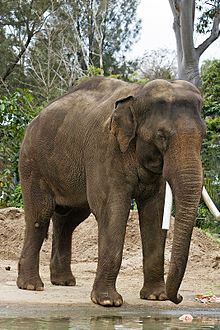 ^ Douglas-Hamilton, I.; Bhallaa, S.; Wittemyera, G.; Vollratha, F. Behavioural reactions of elephants towards a dying and deceased matriarch (PDF). Applied Animal Behaviour Science. 2006, 100 (1): 78–82. doi:10.1016/j.applanim.2006.04.014. （原始内容 (PDF)存档于2012-05-11）. ^ 4.0 4.1 4.2 4.3 4.4 4.5 4.6 Choudhury, A.; Lahiri Choudhury, D. K.; Desai, A.; Duckworth, J. W.; Easa, P. S.; Johnsingh, A. J. T.; Fernando, P.; Hedges, S.; Gunawardena, M.; Kurt, F.; Karanth, U.; Lister, A.; Menon, V.; Riddle, H.; Rübel, A.; Wikramanayake, E. Elephas maximus. IUCN Red List of Threatened Species 2012.2. International Union for Conservation of Nature. 2008 [2012-10-16]. ^ 5.0 5.1 Daniel, p. 174. ^ 7.0 7.1 7.2 Christy, B. 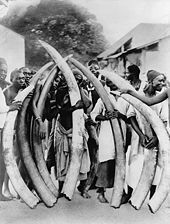 Ivory Worship. National Geographic. October 2012 [17 October 2012]. ^ 8.0 8.1 8.2 8.3 Wylie (2000), pp. 146–48. ^ 10.0 10.1 Griffin, B. Elephants: From the Sacred to the Mundane. (编) Gin Ooi, K. Southeast Asia: A Historical Encyclopedia, from Angkor Wat to East Timor, Volume 1. 2004: 487–89. ISBN 1-57607-770-5.